The all-new 2019 RAM 1500 manages to look sleek and modern while still embodying that muscular stance that so many pickup drivers love. A look at the other full-size pickup trucks on the market today shows just how hard it is to strike the right balance when it comes to styling. Not only is the RAM 1500 one of the best-looking pickup trucks available, it is also fully equipped with a variety of useful exterior features. The 2019 RAM 1500 features standard 18-inch steel wheels that are much stronger than the aluminum wheels seen on some competitors. This leading pickup truck also has standard acoustic front windows that limit the amount of noise coming into the cabin, which creates a more peaceful ride. The RAM 1500 even boasts heated mirrors that can quickly burn off the condensation that often collects on those steamy Southwest Florida mornings. 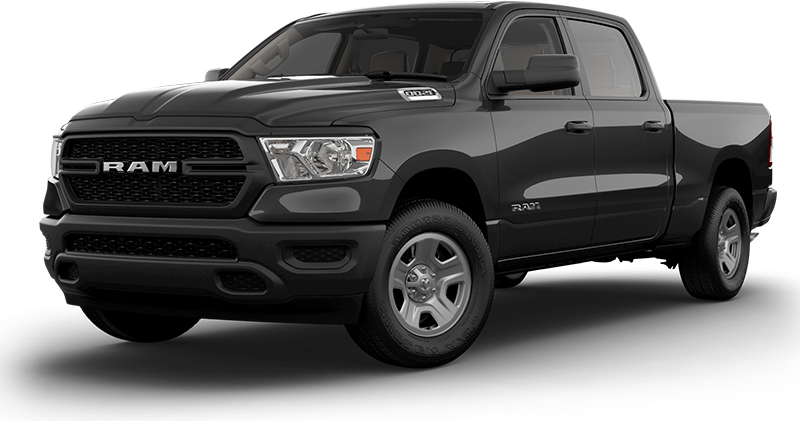 If you’ve been looking through Naples, FL car dealerships for a powerful full-size pickup truck that looks the part, look no further than Naples Chrysler Dodge Jeep RAM near Bonita Springs and Cape Coral, FL. The 2019 RAM 1500 has a tough and comfortable interior that is practical enough for everyday commuters and drivers using the RAM 1500 for heavy-duty work. Many of the other pickups on the market offer reasonably comfortable interiors, but these trucks are often not practical enough for use as Work Vehicles. There’s a reason why so many who need a tough work truck go with the RAM 1500. The RAM 1500 has standard seating for 6 occupants total between the front and rear rows of seats. Many full-size trucks only include standard seating for 3 occupants. The RAM 1500 also features a standard vinyl floor covering that is easy to clean after being soiled by muddy boots and the like. Some competitors have standard cloth flooring that will get dirty and torn up almost immediately. The 2019 RAM 1500 even has a day/night rearview mirror that ensures optimal visibility, no matter when you’re driving. Tired of looking around Naples, FL car dealerships for more info on the safety features of the RAM 1500? Come to Naples Chrysler Dodge Jeep RAM near Bonita Springs, Naples, and Cape Coral, FL today for your test drive. The most important category for many prospective full-size pickup buyers is capability. The 2019 RAM 1500 offers an unmatched level of capability, even on the most affordable trims. Many full-size pickup trucks only offer impressive performance on the higher trims. The 2019 RAM 1500 includes a standard 3.6L V6 which kicks out a towering 305 horsepower. Those seeking even more power will find it in the available 5.7L HEMI® V8 engine with eTorque, which offers best-in-class 4×4 combined fuel economy at an EPA-estimated 19 MPG. The standard 8-speed automatic transmission is capable of quick shifts during spirited driving and of handling the extra strain that comes with towing heavy trailers. The RAM 1500 comes with standard rear-wheel drive, but 4-wheel drive is a popular option for added traction. This capable full-size pickup truck has an astonishing towing capacity of up to 12,750 pounds. Drop by Naples Chrysler Dodge Jeep RAM, one of the best Naples, FL car dealerships, and learn more about the RAM 1500’s towing capacity and other performance specifications. The 2019 RAM 1500 offers an enticing lineup of tech features. The technology in the RAM 1500 runs through the standard Uconnect® 3 infotainment system, which has been praised for being one of the most ergonomic infotainment systems available. The integrated 6-speaker audio system provides a powerful and immersive listening experience, no matter what your musical preferences are. The RAM 1500 even offers optional GPS navigation to ensure that you get where you’re going as quickly as possible. Drivers in Bonita Springs, Cape Coral, and elsewhere in the Naples area can try the technology in the 2019 RAM 1500 for themselves. Swing by the showroom at Naples Chrysler Dodge Jeep RAM for a test drive today.